Like his University of Florida teammate Teez Tabor, cornerback Quincy Wilson has been on an interesting road to the NFL Draft. After spending most of his final collegiate season being considered as a first round corner, some questionable testing and the rise of other cornerbacks in this draft class has dropped Wilson down some draft boards. Still, everyone would be shocked if Wilson fell as far as the end of round two. And after watching the tape, it was obvious why. 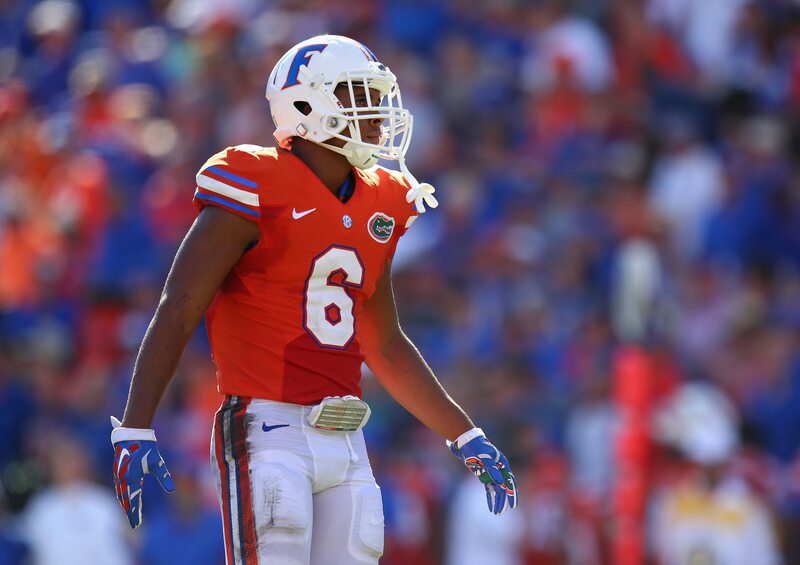 At 6’1″ 211 pounds, Quincy Wilson has the prototypical size of an outside corner in the NFL. With his size comes physicality and confidence. Wilson is a flat-out gambler, who will jump routes in order to make the splashy play whenever possible. While this gambler element could end up with some big plays going over his head, I love the cockiness that Wilson plays the game with. Though he is a gambler, Wilson’s risks seem calculated at most times. He has very good field awareness, and understands where routes are headed right from the snap. His ability to read and diagnose the play is impressive. Consistently showing the ability to jump on in-breaking routes, Wilson’s coverage skills in man are more than adequate. With his size and coverage skills, Wilson could potentially play in a press-man scheme at the next level. Wilson has very long arms which he uses to his advantage in coverage. Multiple times I saw him avoid interfering with the wide-out while still being able to poke his long arms into the catch radius and break up the pass. As a tackler, Wilson is both willing and able to bring down receivers on the outside. He likes to be active against the run, and doesn’t avoid contact whatsoever. Of course, when you are as big as Wilson is, contact is a little less worrisome. Wilson did a good job of shedding blocks on the edge in college, and with his technique and physicality, should be able to do more of the same once in the NFL. He comes downhill to make tackles nicely, which could even have some wondering if safety is in his future somewhere down the line. For now, though, he is an outside cornerback in my opinion. While Quincy Wilson is willing to tackle, his technique is somewhat lacking. Wilson must learn to better drive his hips through contact, and wrap up on offensive players. In coverage, his “gambling” style can sometimes catch up with him. Considering that he is not a very fluid athlete, his lack of lateral quickness and vertical speed can hurt him as well. While he is normally able to diagnose the route and stay on top of it, this is not always the case. When Wilson is unable to do so, he can get beat down the field rather quickly. Wilson is a below average athlete for the cornerback position in the NFL, which will certainly scare off some teams. He will need to be perfect in his technique, and with his hands/jabs in order to make up for this problem. Sometimes, Wilson will actually get too hands-y or physical down the field with receivers, which could result in more penalties at the next level. I have seen Quincy Wilson ranked as high as the number one cornerback in this class, but for me, he falls somewhere in the 8-11 range. Earning a second round grade on my draft board, I think Quincy Wilson can carve out a nice career for himself in the NFL. Hopefully, he will get put into the right system, and will be able to overcome the athletic deficiencies he seems to have.